Shocked by Unexpected Electrical Problems? Don’t take your home’s electricity for granted. If your power is on the fritz, it could prevent you from completing everyday tasks like cooking, cleaning and taking care of business. Ensure it’s running efficiently and safely by choosing Rocafort Electrical Services, LLC. 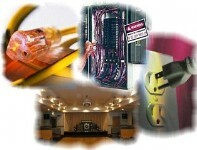 What can our residential and commercial electrician do for you? What’s your next electrical project in Tallahassee or the surrounding areas? Whatever you need help with, you can count on Rocafort Electrical Services to do the job. Trust your electrical project to the experienced pros at Rocafort Electrical Services. With easy access to all kinds of do-it-yourself tips on the Internet, you might be tempted to attempt your electrical upgrade or repair job without the help of a qualified pro. But if you try to complete your project alone, you could expose yourself to serious injury or even death. Don’t take your electrical problem into your own hands and risk a DIY disaster. 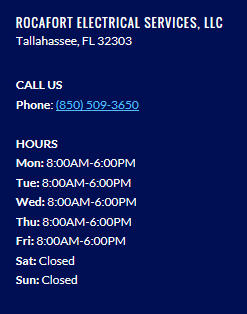 If you live in Tallahassee, Florida or the surrounding area, you can trust Rocafort Electrical Services with your next electrical project. Call us at 850-509-3650 to get started. While you’re on the line, ask about our 10% senior discount.